Another good example of modernista houses in Barcelona is located in Gran Via de les Corts 491, next to Viladomat street. Casa Macari Golferichs maybe is not that relevant if compared to other renown houses in the city but it is certainly interesting and worth the visit. 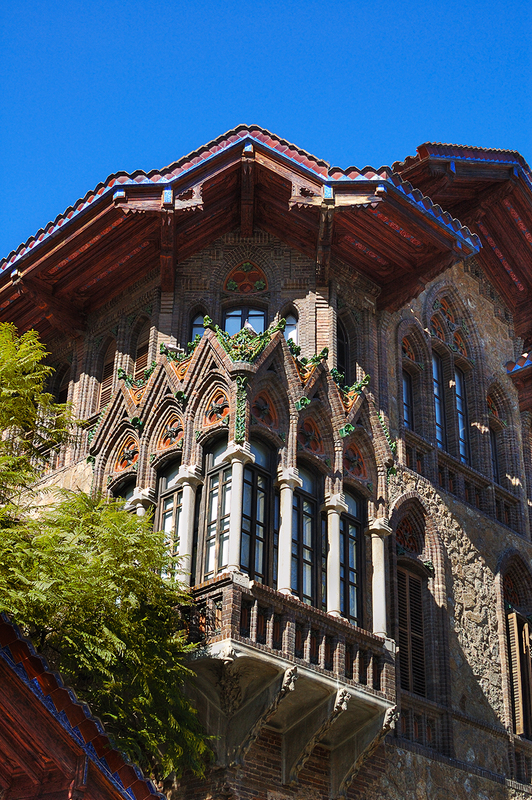 It dates back to 1901 and was built by Joan Rubio i Bellver, the same architect, assistant to Gaudí for 12 years, that created House Roviralta (1903), the Escola Industrial (1912) or participated in the reconstruction of famous Casa dels Canonges. Beyond the pure architectural attraction of this house in L'Eixample Esquerra (left side of the 'Ensanche' quarter) we must say that at present its premises include a civic center, a library and a cultural area devoted to photography (Espai Català Roca) although to be exact the main building holds the Carles Pi i Sunyer Foundation. It was great to capture this beauty and I was specially captivated by this blend of Art Nouveau, Gothic and Neo Medieval elements. There is so much more than just a picture in your latest post! A lot of relevant and useful information! Nice shot! The architecture looks great! I see this photo and now I sing with Freddy Mercury and M.Caballier "Barcelooona". You are happy you do not hear. Great photo, as usual. Muchas gracias por los maravillosos paisajes. Love the photo, very very colorful! Great site also! estas son las cosas que los que se pasean sin cámara de fotos se pierden, nosotros tenemos tendencia a levantar la cabeza mas que el resto! I love your photos! I am visiting Barcelona in a few months and your photos make the wait almost unbearable. I know it's not everyone's cuppa, but I love Barcelona architecture. This photo is fab!